Since promotion to Yorkshire Division 3 last season, Wensleydale have made great strides both in the strength of their playing squad and in the development of their new facilities just outside Leyburn. In the same fixture a year ago, ‘Ensians ran in over 30 points before the opposition woke up in the second half. It was a different story this year in a close-fought encounter with the lead changing hands four times before the visitors finally sealed victory in the closing minutes. The home pack got stuck in early on with some strong driving in the visitors’ half producing a penalty which they converted to establish a 3 – 0 lead on 7 minutes. Eventually ‘Ensians managed to get their hands on the ball, but a heavy shower made handling difficult and progress was halted by a scrum following a knock-on. Despite being outweighed by the opposition pack, the visiting front row of Danny McCabe, Jim Dyson and Paddy Phipps managed to disrupt the home scrum and turnover ball gave fly half Will Cooper chance to fire a kick into the home 22. The visitors then pressured the home lineout through locks Matt Taylor and Ali Campbell. When the ball went loose, No. 8 Rob Arbuckle was on hand to gather and force his way over in the corner, giving the visitors a slender 5 – 3 lead on 15 minutes. Both sides were having problems handling the greasy ball with flankers Joe Armitage and Luke Cowdell leading the way with solid tackles in defence. The hosts received two yellow cards mid-way through the half with their heavy forward lying on the ball and a few minutes later with another forward persistently offside. With the numerical advantage ‘Ensians attacked through centres Prest and Eaves, but the home defence held. Another infringement gave the on-form home kicker a chance as his side regained a 6 – 5 lead on 37 minutes. After the break both sides had chances, but it was the hosts who struck again with a penalty to extend their lead to 9 – 5 on 55 minutes. Flanker Sam Featherstone, scrum half Lewis Robinson and centre Carl Paterson came off the bench for the visitors with Paterson immediately putting in some deft touches with the boot. It was ‘Ensians who looked the most dangerous in attack with full-back Alex Murphy and winger Connor Bateman always threatening. From pressure in the home 22, slick handling by the visitors’ backs allowed Paterson to slice through. As the cover scrambled across, he offloaded to the ever-present Armitage who went in under the posts. The conversion by Paterson gave the visitors a 12 – 9 lead on 67 minutes. However, this was short-lived as the hosts then levelled the scores at 12 – 12 with a fourth penalty on 70 minutes. 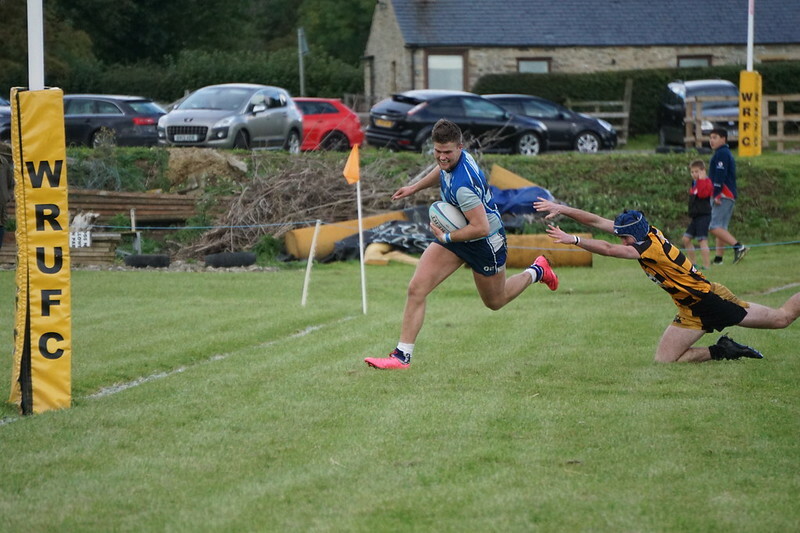 In the final minutes with ‘Ensians applying all the pressure, fly half Will Cooper picked up a pass from his boots and fed winger Batemen who joined the line to open up a gap down the middle. As the cover closed in, he fed centre Ollie Eaves who cut inside to go over near the posts. Paterson’s conversion opened up a 19 – 12 lead on 75 minutes. The visitors then defended soundly until the final whistle. This was a well-deserved victory for ‘Ensians with their spirit and determination carrying them through. Credit must go to the well-drilled home side who were sound in both defence and attack. There will be many visiting sides this season who will find it hard-going to come away with a win in this rural setting. Next week ‘Ensians are at home to Aireborough in the local derby.